Location: About 1km above Dolwen Point, in churchyard near junction of B4314 and minor road to Marros. Anglican parish church, medieval origins but thoroughly restored in 1869 by John Prichard of Llandaff, who rebuilt the tower top as a saddleback roof, reroofed, rewindowed and refitted the rest. He also replaced the chancel arch. Prichard in 1867 proposed a conservative restoration, but already then had reached the opinion that the tower had (uniquely in the county) had a saddleback roof. The church was reported as "out of repair" in 1672 and the tower had fallen into the church by 1710. There had been some restoration in about 1814 but was reported "somewhat dilapidated" in 1861, with a "rude and small" chancel arch. Parish church, rubble stone with slate roofs and coped shouldered gables with cross finials. Gutters on stone corbels. W tower, nave, S porch, chancel and N vestry with organ chamber. W tower is grey stone, thin with battered base. Narrow loops, 4 vertically-ordered on W front. Tower top has C19 gabled roof with stone gutters N & S, overhanging E and W. Tower S has small C20 lower window and two loops above, the top one with louvres. Similar N side. Nave S stonework is mostly renewed. Large C19 S porch with pointed arch and stone voussoirs. C19 rafter roof, stone seats within and glazed inner screen. Inner S door is C19 with painted ashlar surround, incised inscription, hoodmould and carved head stops. Board door with elaborate wrought iron hinges. Large flush windows of 1867 each side, 2-light left, 3-light right, with simple chamfers to lights, sandstone surrounds banded in red. Attached monument to Phillip and Zacharia Price (dd1623), possibly late C17 with hourglass. Nave N has C19 trefoil-headed single light to left, lighting pulpit. Chancel S has small projection to extreme left with stone sloping coping and one tiny medieval single light. Similar, though larger, medieval light to right. Attached memorial to four children of Joseph Howell (dd 1816-30). E end has ogee-traceried 2-light window, possibly early C15. Pierced C19 Celtic cross roundel in apex. Chancel N has 2-gabled projecting organ chamber and vestry, with one Y-tracery 2-light window in each gable, tiny trefoil-headed W window. E side has wall-face chimney in ashlar with chamfered angles to right of pointed door with rock-faced stone voussoirs. A small C19 outbuilding to right of door has E end coped gable and small window. Door with stone voussoirs to N side. Whitewashed plastered walls, tiled floors, open timber roofs. Nave has 4-bay roof of arch-braced collar trusses with corbels and brattishing to collars. Gable-headed stoup next to S door. Pointed narrow W door into tower. Tower interior is not floored. Plastered pointed chancel arch with incised inscription over. Two low whitewashed ashlar walls in chancel arch, the coping gabled with brattishing. Chancel has more elaborate roof of 3 bays with arch braces forming pointed arches under collars, king posts over and braces up to ridge beam. Organ recess to N. Three fine fossiliferous marble steps to sanctuary. Chancel S wall recess with cambered head. N wall pointed door to vestry. Vestry has 3-sided boarded roof and E wall fireplace with iron grate. N pointed window similar to S window is now internal, opening into vestry. Sanctuary has some encaustic tiles. E wall has chamfered pointed recess to left, with pyramid stops to chamfers. Fittings: Seven-sided medieval stone font, scallopped to round shaft. C19 base. High Victorian stone drum pulpit, now whitewashed, Moulded base over squat half-round pier, bands of flush grey stone top and bottom, inset with flush quatrefoils and roundels. Moulded top cornice, steps up from S side with gabled tiny buttress and wrought iron rails with brass flowers. Hand-rail has carved end stop. Pews have shaped ends and pegged joints. Horizontally-boarded back panels. Chancel stalls and reading desks of 1867. Fine wrought iron sanctuary rails with 5 arches of scrolled iron with fleurs de lys in spandrels and twisted horizontal bar joining uprights. Stained glass: Nave S 2-light 1960 'I am the Resurrection', Christ and St Mary Magdalen. Nave S 3-lt 3 panels on clear ground to Rev John Evans (d 1928). N single light Ascension to G. Llloyd (d 1950). E window of 2 lights of 1867 perhaps by Wailes with 2 panels of Christ stilling the waters. Chancel S window has patterned quarries of c1867. Vestry has 1998 N window 2-light Nativity by Janet Hardy. Memorials N side plaque to William and Martin James of Great House (dd 1803 and 1806), John Rees (d 1832) and Sarah Rees (nee James - d 1843). Organ by F.E. Wade of Tenby, 1899. Listed II* as a parish church with substantial medieval masonry, including tower, with high quality High Victorian restoration by John Prichard, including fine fittings. Situated just to the N of Great House. The house is some 200m S of the junction of the B4314 and a minor road to Marros. Situated to the front and E of Great House. The house is some 200m S of the junction of the B4314 and a minor road to Marros. 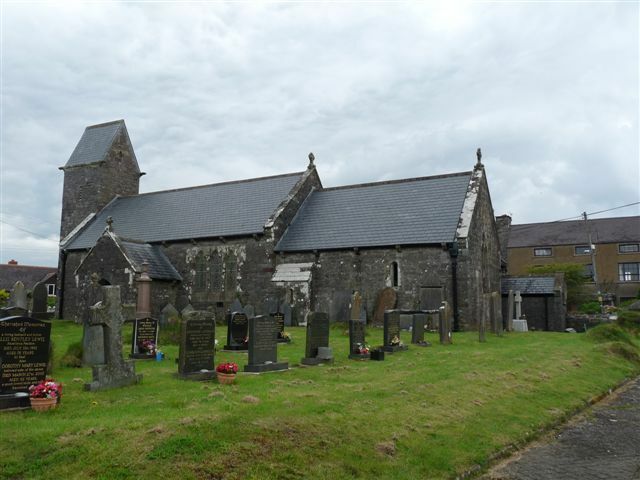 Situated SE of the church at Pendine some 200m S of the junction of the B4314 and a minor road to Marros. Situated in a wood above and to the E of Grove Caravan Park. There are two lime kilns in the wood and this is the one to the E.